LEN - www.lankaenews.com | Stupid President who lopped the branch off main tree while still seated on the branch must resign forthwith. 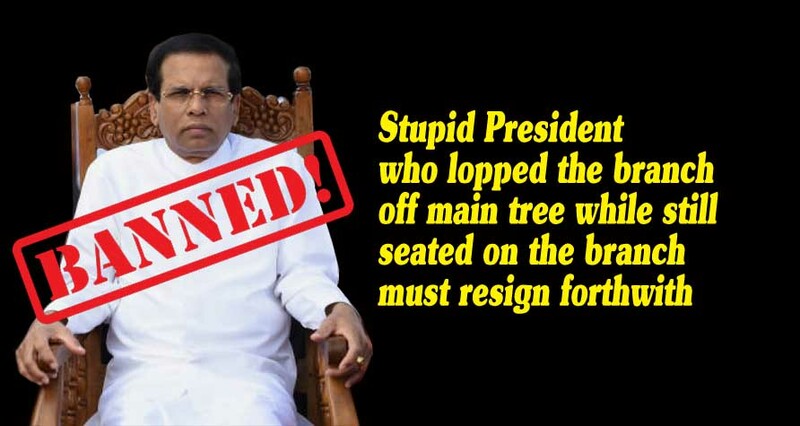 Stupid President who lopped the branch off main tree while still seated on the branch must resign forthwith. (Lanka-e-News - 11.Feb.2018, 11.30PM) It is the conspiratorial president and none else who by acting stupidly , myopically and without perspicacity or political acumen who should hold himself responsible for the local government election debacle , and therefore tender his resignation forthwith , the party leaders who put him on the pedestal of power , civil organization leaders and several Mahanayakes have via phone calls blamed the president , informed sources close to the president revealed. The president who was propelled to that exalted post by the indefatigable and undiluted efforts of these groups on 2015-01-08 , most shamelessly did a sordid U turn within 48 hours of his appointment to betray the people who elected him to power and broke his solemn promises to prove beyond all doubts he is a traitor out and out . And now because of his squalid politics , he plunged not only himself , but even the government and the country into deep despair which are the evil fallouts of his villainies and treacheries .But what is most perilous and portentous in the present context is , he has again driven the country to the threshold of a dictatorial family rule , from which corrupt and crooked rulers the country was extricated on 2015-01-08 amidst great odds and obstacles. President Sirisena who made a thousand promises that he would flush out all the crooks and cronies from the nooks and crannies to apprehend every culprit , instead prompted by ulterior motives hurled false accusations , through his media henchmen against the very government of which he was the head. Consequent upon his faceless , policy less and rudderless attitude , he not only dragged down the SLFP which commanded some respect to an 4.44% popularity at the polls , while he is still looking for scapegoats to fasten the blame in his characteristic style. The president who put his heart and soul into the election campaign like his own presidential election , only to bite the dust must immediately resign from his post if he has any sense of shame. It is the view of the groups that the president who was so stupid as to lop a branch off the main tree while still seated on the very branch , only finally courted disaster like Humpty Dumpty. Hence , the president who made a hash of the entire process must resign immediately , they insisted.